Present state: Roadside station building forms part of residential property. The westbound (Liverpool Lime Street) platform wall can still be seen from a distance by standing on City Road bridge. The eastbound platform has been demolished with only a few bricks remaining alongside the track. Notes: Walton & Anfield station was located on the London & North Western Railway’s (LNWR) Canada Dock branch which opened to goods services on 15 October 1866. 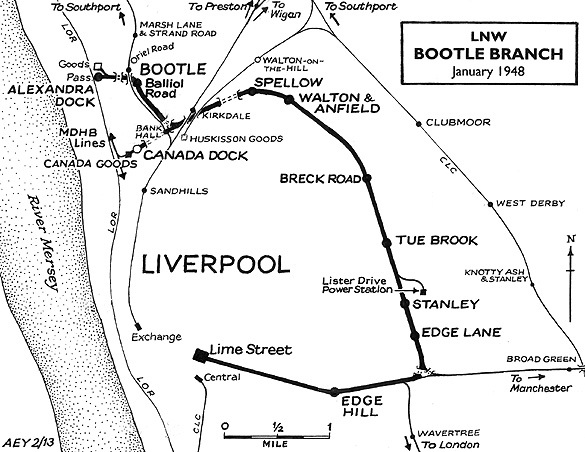 The branch provided a connection between the LNWR Liverpool and Manchester line at Edge Hill with Canada Dock which was, at that time, at the most northerly end of the Liverpool dock system. The line was built to serve the northern docks which were capable of taking larger vessels. Passenger services were introduced on the southern end of the line before it had been completed on 1 June 1866, running between Liverpool Lime Street and Tue Brook. On 1 July 1870 the passenger service was extended to run to Canada Dock, and Walton & Anfield was opened to serve it. The station was originally called Walton. It was located on the east side of Walton Lane to the south-east of Walton-on-the-Hill. The line at this point was on an embankment and it passed over Walton Lane on a bridge. The station had two platforms, both of which were reached via sloping pathways that connected to Walton Lane on either side of the bridge. The main facilities were located on the up platform (Liverpool direction) in a single-storey timber building with a hipped slate roof with cresting. The eaves were embellished with modillions, and a small cross-gable was placed above the entrance from the platform, which also had the luxury of a tiny canopy. The building contained a booking office, waiting rooms and toilets. To the rear of the station building there were four wooden sheds that presumably acted as storage areas. On the down platform (Canada Dock direction) there was a smaller building in a similar style to that on the up side; it contained a small office and a waiting room. Walton station had extensive goods facilities located to the east of the passenger station on the north side of the line. These were approached from Cherry Lane on which stood a single-storey brick goods office. 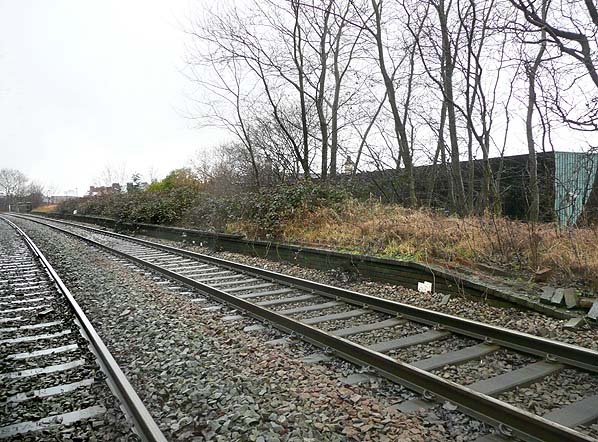 Adjacent to the office was a gateway through which passed a road which provided a link to four sidings. Facilities included two weighing machines and a crane. Anfield Sidings signal box had opened by August 1879 to control access to the goods sidings. At the time of opening Walton was served by passenger trains between Liverpool Lime Street and Canada Dock. On 5 September 1881 a line was opened from the Canada Dock branch to Alexandra Dock. Passenger services were introduced between Liverpool Lime Street and Alexandra Dock and they called at Walton. By December 1895 there were thirty up and thirty-one down trains from Walton on Monday-to-Saturday (click here to see a table showing the trains). This represented a good level of service that for periods of the day was half-hourly. There was no service on Sundays. On 1 January 1910 the station was renamed Walton & Anfield, the district of Anfield being to the south-east of the station. A large cemetery called Anfield had been laid out to the south of the station on the eastern side of Walton Lane in the early 1860s. Anfield Sidings signal box closed in February 1910 and was replaced with a LNWR Type 5 brick base with a wooden upper cabin structure. The new box was located on the up side of the line and had an 18-lever frame. The July 1922 timetable showed eighteen up and nineteen down trains on Monday-to-Friday. Five of the down services ran to Canada Dock and fourteen to Alexandra Dock. All of the up services ran to Liverpool Lime Street. On Saturdays there were five fewer services in each direction. On 1 January the Canada Dock branch became part of the London Midland & Scottish Railway (LMS). By the 1920s a Liverpool Corporation Tramways route had extended along Walton Lane, running eastwards towards large new housing estates that had opened to the east of the station. The tramway offered fast and frequent services into central Liverpool on a route that was much more direct than the railway. The trams had a significant impact on the numbers of passengers who used Walton & Anfield. In summer 1932 there were five trains from Walton & Anfield to Canada Dock, twelve trains to Alexandra Dock and seventeen to Liverpool Lime Street on Monday-to-Saturday only. The first departure left Walton & Anfield for Alexandra Dock at 6.47am. The last departure was also for Alexandra Dock and it departed at 10.37pm. Being such a strategic link with the docks during the Second World War the Canada Dock branch was a target for enemy aircraft and it was hit many times. On 4 May 1941 Canada Dock station was badly damaged and passenger services were withdrawn. This left Walton & Anfield with only the Liverpool Lime Street and Alexandra Dock service. After the war the Canada Dock service was not restored. On 1 January 1948 Walton & Anfield became part of British Railways’ London Midland Region. As a passenger station it did not survive long after Nationalisation, closing on 31 May 1948. A passenger service between Liverpool Lime Street and Spellow (the next station from Walton & Anfield in the down direction) was shown in the Summer 1949 timetable with only one train in each direction. It is not known if the service actually ran and it did not serve Walton & Anfield. After 1949 passenger services continued to travel through the station in the form of through coaches between Liverpool and Southport and which were attached to London Euston services. In the 1960s connecting DMUs replaced the through coaches. Walton & Anfield closed to goods services on 7 December 1964 and the sidings were lifted shortly after. 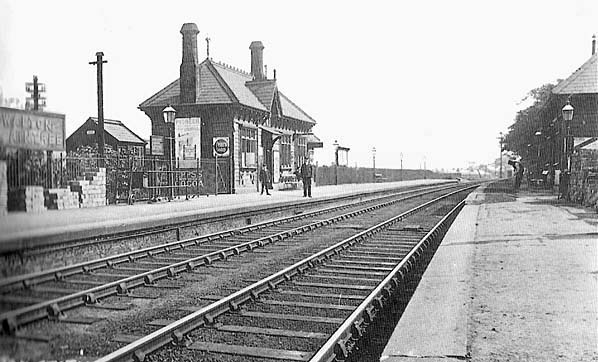 The passenger station platforms had remained in situ after closure. Anfield Sidings signal box closed on Sunday 24 October 1965. The last Liverpool and Southport DMUs ran on 9 October 1977 and the Canada Dock branch, by that time known as the Bootle branch, became a freight-only railway. Dock traffic had been in decline since the 1960s and had reached a low ebb by 1980 when only a handful of booked trains ran through Walton & Anfield. After 1980 traffic levels began to pick up, first with the introduction of Freightliner services to and from Seaforth, and in the second half of the 1980s coal began to be imported through Liverpool docks. On 12 February 1993 two year old James Bulger was murdered at Walton & Anfield station by ten year old Robert Thompson and John Venables. On 14 February 1993 the body of James Bulger was discovered at the station on the down line. The murder was widely reported and Walton & Anfield station was widely photographed and filmed. In 2013 the up platform was extant and the frontage of the goods office on Cherry Lane could still be seen. 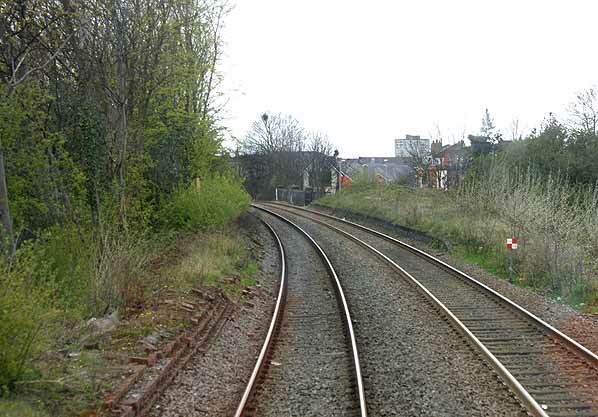 The line through Walton & Anfield had become a very busy freight artery and Merseytravel (the area transport authority) had given consideration to reopening the Bootle branch and Walton & Anfield station to passenger services. sign reads ‘Walton for Aintree’. Aintree was the home of the Grand National horse race and the LNWR were obviously hoping to encourage passengers to use Walton as a means of travelling to the races. The hope was somewhat optimistic as Aintree was nearly two miles away and it had two stations belonging to other railway companies. Walton & Anfield station shown on a 25-inch scale map from 1890. Walton & Anfield station shown on a town plan from 1910. The passenger and goods facilities at Walton & Anfield shown on a 25-inch scale map from 1927. The Liverpool Corporation tramway which competed with the station for traffic can be seen passing under the line to the west of the station. 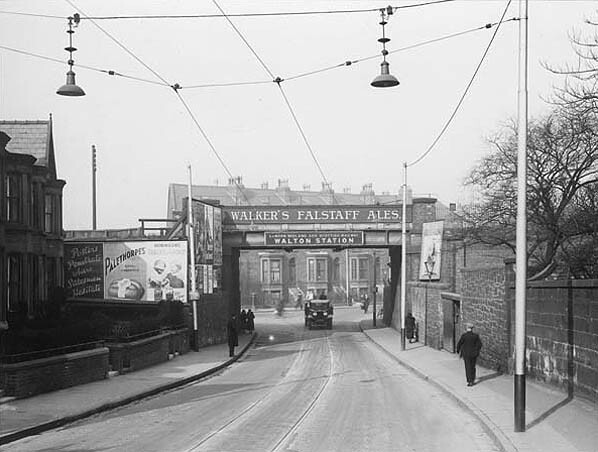 Looking north-east along Walton Lane towards Walton & Anfield Station in the 1930s. The gateway to the down platform can be seen just beyond the pedestrian to the right. 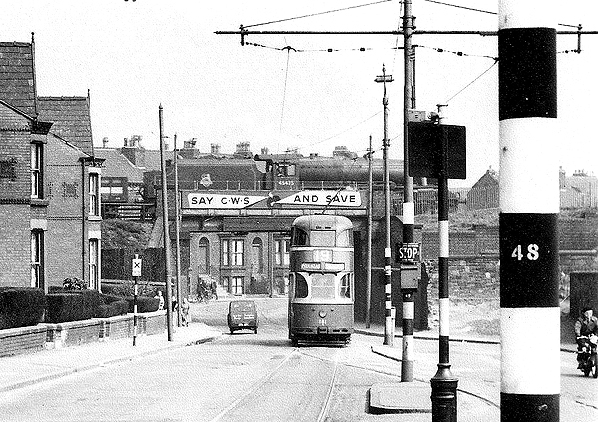 A view looking along walton lane in 1954. Walton & Anfield station can be seen to the right. Passing over Walton Lane and about to pass through the station is an 'up' freight. A Liverpool Corporation tram is seen en route to Liverpool city centre. 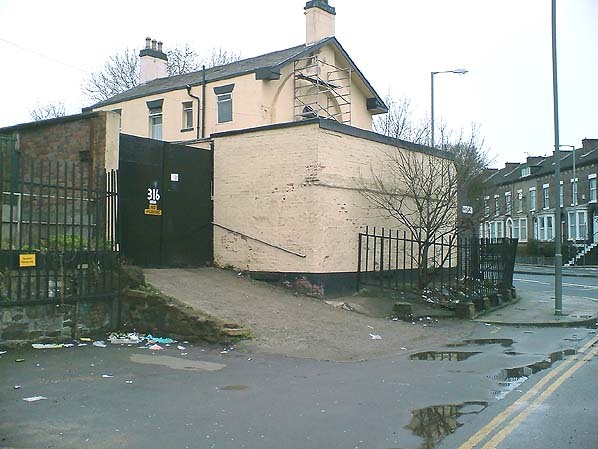 The remains of the Walton & Anfield goods office in February 2005. The entrance to the goods yard was to left of the view. There had been a weigh bridge at this location. The Walton & Anfield up platform (Liverpool Lime Street direction) looking north in January 2008. It was still substantially intact 50 years after the station closed to passenger services. Walton & Anfield station looking north-west on 14 April 2012. The remains of the down platform can be seen to the left. the up platform seen right is in much better condition.